BC’s Sunshine Coast became the 18th school district in the province to implement a stand-alone anti-homophobia policy on June 12, receiving unanimous support from board members. The sexual orientation and gender identity policy, as it’s officially known, was initiated by lesbian trustee Betty Baxter in response to a request from a mother who attended a parent advisory council in February. Board chair Silas White says he is excited the policy was conceived and implemented within four months in a fairly straightforward manner. So far, only 18 of BC’s 60 school districts have passed anti-homophobia policy. The guidelines that accompany Sunshine Coast’s policy include an extensive glossary of LGBT-related terms developed by two students from Chatelech Secondary’s gay-straight alliance (GSA). Sunshine Coast School District is located across Howe Sound approximately 30 kilometres northwest of Vancouver and includes the communities of Gibsons, Roberts Creek and Sechelt. Baxter describes it as a progressive and gay-friendly region. 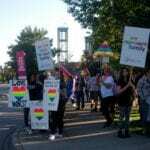 At least four more BC school districts are scheduled to consider anti-homophobia policies this month, including Bulkley Valley and Fraser Cascade, on June 19; Saanich, on June 20; and Surrey, on June 21.